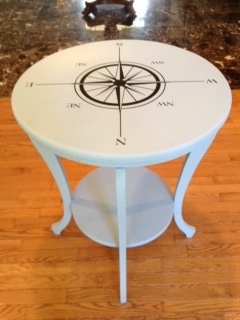 I used Louis Blue Chalk Paint. This time around, I found it to be very easy to use. I love the texture it gives to the piece. It looks weathered and kind of washed out. It will fit in nicely at the Island home. 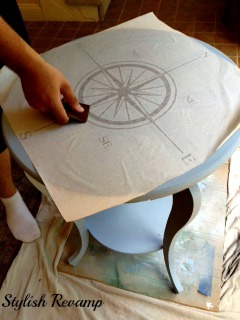 Once the paint dried, I applied a compass transfer that I order from amazon.com Also, very easy to use. So the next time you see a piece of furniture that has seen better days just remember with a little paint you can completely revamp it into something new. 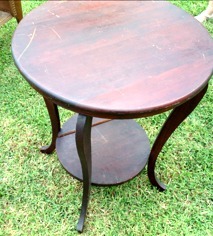 Love the simple beauty of this table! Great job. 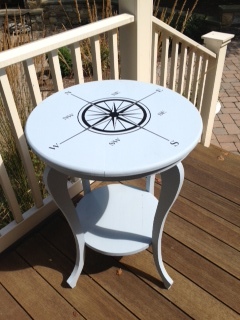 The compass picture spoke to me – I have a perfect place for it. I’m hoping you can provide more information about it – I went on art.com, but could not find it. I appreciate any help. Oops! Sorry about that. I ordered it from amazon.com. I corrected the link on my post. Please let me know if you have any trouble finding it. Thanks for viewing the site. Glad you liked the table! Looks great! I love the compass! Loving this, I actually recently just donated a round table just like yours, would have been a fun project!